We believe that art is one way of strenghtening peoples experience of nature. Therefore we like the idea of involving art and artists. to arrange flowers naturally right into the earth. Thanks to Gabrieles low flower table, inspired by Japan, you all of the sudden come closer to all the mosses and little plants that grow all around you and get aware of the small subtile details – like the gorgeous shadows. In the middle of the forest Gabriele created this magic space to experience the forest with its ever changing and chasing sun rays and shadows: Komorebi. Komorebi is a beautiful unique Japanese word that cannot be translated with just one word. Komorebi (木漏れ日), means the sunshine filtering through the leaves of trees. It is also mentioned as the interplay between the light and the leaves which is observed especially on the ground. It really is this game of chasing lights and shadows that is so fascinating – and so difficult to catch on a photo. Here is a place to experience it yourself with mindfulness, awareness – and a lot of fun. 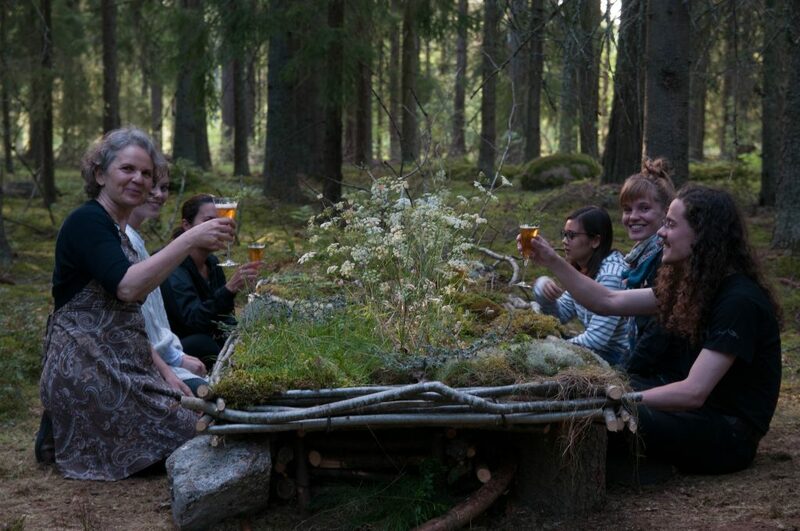 Komorebi is a place for creativity- and all our guests are invited to get involved: To water the table if needed, to decorate it and to use it. With the small hidden vases that are stuck into the earth the atmosphere and feeling can be changed quickly and flowers from the meadows suddenly can flower in the middle of the forest. Summertime at 12.30, Komorebi will be there if you are lucky and the sun is not hidden by clouds. Hope you will be there, too! 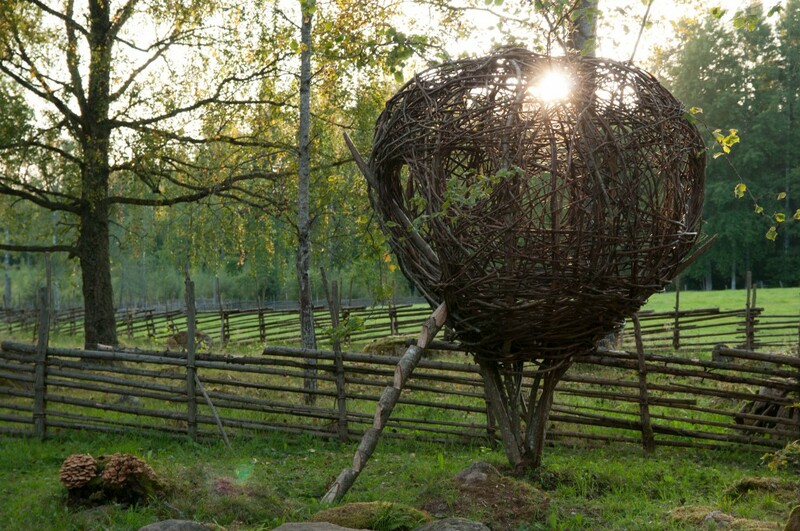 Hannes sees the nest as a symbol of the individuals power to both decide what it needs and wants to create, based on a deep relationship and understanding of the land. Using the nesting process of birds as a creative strategy. Found materials, the discarded, flimsy and valueless, are fused together to create structure, space and often beauty. The making of the nest connects its maker and user to the land where it was made. As such it is a strategy to connect to nature and to places in much the same way as we have created shelter and homes for most of history. In the increasingly disconnected and abstract world this strategy or effect becomes in many ways more important than the object itself. The nest symbolizes the basic needs: proximity, sense of context and creativity. Hannes Wingate believes that being connected to nature changes us and lays a foundation upon which we make better decisions. It raises memories of being a child or in many cases living more simply or closer to the land.